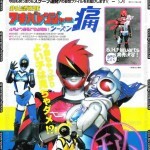 Akibaranger Season 2 Merchandise News – S.H. Figuarts and More! Thanks to the ever insightful DrillBIT we have news of the forthcoming S.H. Figuarts for Akibaranger season 2! First we have confirmation via a Bandai press release that S.H. 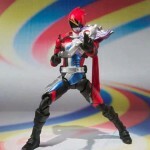 Figuarts Super Akiba Red will be released in June, priced at 3675 yen! His teammates Akiba Blue and Akiba Yellow are tentatively set to be released in July for the same price. Also revealed via this pdf were the Japanese release details of S.H. Figuarts Dragonranger and Tyrannoranger from Zyuranger! It is assumed both will have some relation to the Akibaranger figure releases, however what exactly this will be is currently unconfirmed. Dragonranger is tentatively due for release in June, while Tyrannoranger will be released the following month in July – both again priced 3675 yen. Finally DrillBIT brings us some unconfirmed news of other Figuarts seen in the Akibaranger PV seen at today’s press release. Among those seen were Black Condor and Blue Swallow of Jetman, Deka Yellow of Dekaranger and Bouken Pink of Boukenger! This is the first news of a Blue Swallow figuart, and the first news of a release date for Bouken Pink (who has been seen alongside her team members at various events). In non-Figuart merchandise news, a Twitter user has leaked that Malshina’s MMZ will be released, and is named the MoyaMoya Z-Cune. However further details are still unconfirmed. You can check out images of the three Akibaranger Figuarts after the jump! Scans of the latest Figure-Oh Magazine, #181 have just hit and with them we get more looks at Hikonin Sentai Akibaranger Season 2! These images show off the new Akibaranger costumes in all their glory, noting the differences from the original suits to these new updates. Also included in these scans are multiple images of the new trio of S.H. Figuarts Akibarangers which give us a better look at Cho Akibared as well as the new hairstyles for Yellow and Blue. A brief snippet on the side of the Season 1 recap page even gives us 2 new images of S.H. Figuarts Delu Knight and confirms his release in July for 3675 yen! Last but not least is a pair of new images from Super Hero Taisen Z! One showing Wizard, Beast, and Goaki Silver facing off against Sharivan! And the other showing off more of the Space Shocker elite, the new buddyroid Chisato, as well as Gokai Silver disguised (or brainwashed?) as a Shocker Soldier! Thanks to forum member DrillBit for pointing us to the cover of Figure Oh #181. This image, Courtesy of the Cyber Gundam Blog has a big reveal for Hikounin Sentai Akibaranger Season 2 and its’ fans! 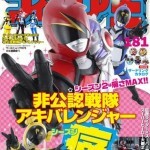 According to the cover of the latest Figure Oh Magazine the Akibarangers will each be getting a slight costume makeover! Gone are the trademark pigtails of the Akiba Yellow helmet, instead replaced by Buns. AKiba Blue has likewise lost her split pony tail and had it replaced by a bun top. And Akiba Red appears to be sporting a new power up armor made from none other than the New Z-Cune Aoi-Tan! This issue of Figure Oh is also said to reveal S.H. Figuarts Kamen Rider Beast! You’ve probably already heard the previously reported news of Hikonin Sentai Akibaranger getting a second season, however Toei have just uploaded the official announcement from the recent Super Hero Festival to their Youtube account! While the video is unsubbed, the video features Akiba Red himself Nobuo Akagi taking to the stage to announce the second season. Check out the video below! At the Kamen Rider and Super Sentai live event held in Toyko earlier today, it was finally confirmed the Unofficial Sentai Akibaranger will indeed be returning for a second season! At this current point in time there’s no further news other than the initial confirmation, however fans have been told to keep an eye on the official Akibaranger website for future updates. Discuss this news after the jump! Season 2 of Akibaranger Rumored for April? If you recall about a week ago we ran a story featuring some rumors on the as of yet unconfirmed Akibaranger Season 2. Well we’ve discovered some more new info but file this story under rumor as well. The same reliable 2ch poster that brought us the original news of Season 2 has let out information that the season will begin in April. And that Zukun Lab, the animation studio responsible for the shows CG, has already begun work on the new season! IF this turns out to be true that means we are now only 6 months away from a new season, and perhaps only a month or more away form the reveal of that season officially. Of course with it being April, this could become one GIANT April Fool’s Joke. True or not this rumor is sure to excite fans of the series. Join the discussion and let us know what you think. Hey! Have you heard the hot rumors about Unofficial Sentai Akibaranger the Movie: Treasure of the Maid Empire? Well that’s all they are! Rumors of an Akibaranger feature film were actually fabricated by the shows production staff! It was an elaborate gag that began as a joke on twitter and played out quietly at Tamashii Nations 2012. They even went so far as to produce fake movie posters, tickets, and an Akiba Red giveaway mini figure! However, don’t let this get you down as the rumor mill has begun churning again across the web. A certain reliable poster on 2chan is letting it leak that Toei is secretly filming an Unofficial Sentai Akibaranger Season 2! Think this could be too good to be true? Well this individual has leaked very reliable rumors in the past relating to Kamen Rider Fourze and the Eternal V Cinema. There’s a chance my delusional brothers and sisters that this is happening! A chance for more of the fan favorite, critically and commercially successful, series to return! Stayed tuned for more info as it becomes available. 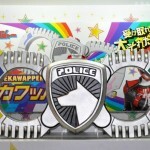 Akibaranger 1/1 Scale Deka-Wapper Coming? While we saw several new Unofficial Sentai Akibaranger items at the 5th Anniversary Tamashii Nations event a few weeks back, there was one thing that seemed to slip under everyone’s noses. Among the recent Amiami facebook page update to their gallery of the event, they have uploaded an image of a 1/1 scale Deka-Wapper, the inordinate power of the Dekarangers and first component to the inordinate cannon! 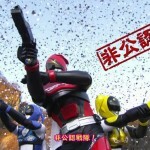 Will the Deka-Wapper see release, along with the Akibaranger ranger keys and various other new items seen at the event? Only time will tell, but in the meantime check out the full sized image after the jump! Tamashii Nation has posted a huge gallery of the up coming S.H. Figuart Robo Itashar. From the recent success Hikōnin Senta Akibaranger, S.H. Figuarts releases what poise to be the largest Figuart release to date,measuring in at nearly 15″ in mecha mode. 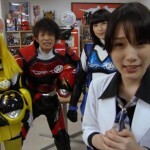 The Robo Itashar actually houses all three members of the Akibaranger Team. While prices for all the figures on display were not readily available, the price listed for Wild Tiger from Tiger & Bunny was a whopping ¥25,000.